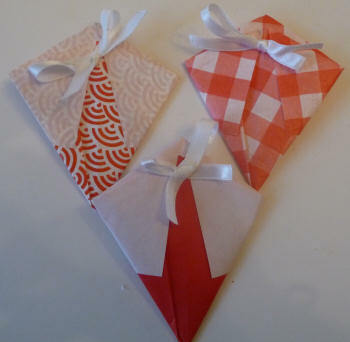 Please note: The origami packet is based on our Origami Cone. When you have filled your packets and tied them up, write the numbers 1-24 on the front and mount them in random order on a large piece of card. We've stuck to our red and white Christmas colours, but these can look even more exciting for little kids if you use up scraps of last year's Christmas gift wrap and ribbon. 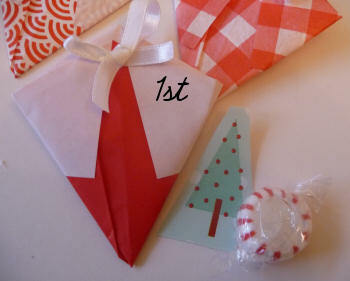 And of course the children will enjoy helping you to create the advent calendar too. Make 24 little origami baskets, using scraps of Christmas gift wrap or origami paper, and fill each one with something special. Use our ideas for filling your home-made advent calendars for inspiration.